Winter is my absolute favorite time of year but the cold weather can sometimes be brutal on my skin. I always like to keep several products in rotation because my skin changes so much. Sometimes I'm extremely oily and other times I have dry skin that peels around my nose (not cute!) Whatever the case I always like to be prepared. Liz Earle has an awesome skincare line that's perfect for all skin types and can remedy many common issues. I actually reviewed a few other products from her collection before and you can check that out here. With last minute holiday gifts in mind, I thought the Liz Earle Daily Skincare Duo would be the perfect gift for the girl who likes to primp and keep her skin flawless! 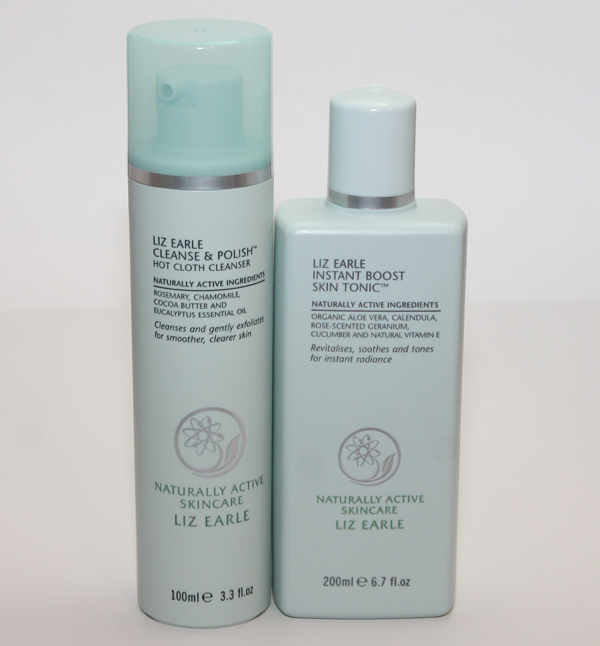 The duo comes with two essential Liz Earle skincare products which include the Cleanse & Polish Hot Cloth Cleanser and Instant Boost Skin Tonic -both formulated to work together to promote a well balanced complexion. Glow: The packaging is so cute! I love that it comes gift-ready which takes the pressure off having to wrap it if you don't want to. I'll start with the Cleanse & Polish Hot Cloth Cleanser, I've reviewed this before and love it just as much then as I do now. The cleanser comes with 2 white muslin cloths which are used to wipe away the residue after you massage the cleanser onto your face and neck. The formula is like a creamy lotion and once I wiped it away my skin immediately felt smoother and I could even see the dead skin cells left behind on the muslin cloth (ew!) The cool thing is that the cloths are washable so you can continue to use them. The Instant Boost Skin Tonic is a non-drying toner which gently smooths, refreshes and brightens the skin. It also has a soft floral scent to it which I really love. Would I Recommend It? I would! The duo makes a great gift and also keeps your skin looking youthful and clear, what more could a girl ask for? Where To Buy: The Liz Earle Daily Skincare Duo is limited edition and currently retails for $45.50. I'm not sure how long the gift set will be available (more than likely just through the holidays) but the good news is that both products will still be available to purchase individually because they are part of the permanent collection. To learn more or to purchase please visit www.lizearle.com. Great buy! I;ve heard great things about these.